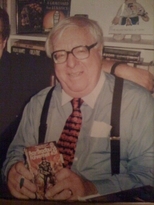 Some Photos of Ray Bradbury at Phantom Bookshop in Ventura, California. 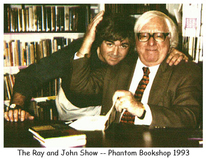 Ray loved our shop and we had massive amounts of people turn out for these wonderful book signings. Here are a few photos from the 1990s. -John Anthony Miller and Katie Crawford-Miller. I want to thank Katie Crawford-Miller and Sifu Manuel Rodriguez and my dead ex-friend, Sean Casteel of Ventura for their wonderful help with putting on these book signings. Without them it could not have been done. - John Anthony Miller at Phantom Bookshop. All photographic images and text are Copyright John Anthony Miller 2014. All Rights Reserved. If you wish to use a photograph, please ask permission. Thank you, John Anthony Miller.